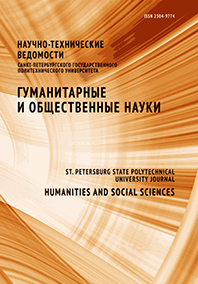 The article is dedicated the significant problem of the conceptual grounds of the humanitarian approach to the analysis of modern technological culture. The author’s goal is the refinement of the principles of humanitarian control in the design of interactions in anthropogenic environments. studying the origins of modern humanitarian control over the information flows, the author uses the systematic method. special attention is paid to the phenomenona of the worldview and the universe and the relationship of science and religion in the formation of the life-world. It is emphasized that soldatov’s civilizational approach, which highlights the importance of ethical communication as the basis of humanitarian design of interactions in anthropogenic environments, is extremely important for the sustainable development of society and the technosphere in the information stage. in anthropogenic environments. studying the origins of modern humanitarian control over the information flows, the author uses the systematic method. special attention is paid to the phenomenona of the worldview and the universe and the relationship of science and religion in the formation of the life-world. it is emphasized that soldatov’s civilizational approach, which highlights the importance of ethical communication as the basis of humanitarian design of interactions in anthropogenic environments, is extremely important for the sustainable development of society and the technosphere in the information stage. Civilization is currently treated as a knowledge society, combining the components of the technosphere and the political, ethical, cultural, and spiritual dimensions of development. The ethical line of the relationship between science and religion is important for the formation of the human life-world. This concept is intended to counteract the technologies of information manipulation based on the mechanisms of imitation and uncritical perception in the adaptation of individuals to the informationcommunicative environment.